Let your creativity flourish with the Office Marshal dry erase whiteboard... where new ideas come to life! Ideal for office or home use, Office Marshal are dedicated to providing you with professional quality office essentials without compromise. Impermeable, scratch and stain resistant white board surface - designed for years of use! Made from a high quality scratch resistant enamel, the magnetic bulletin whiteboard sur-face provides excellent color contrast to ensure excellent readability even from a distance. 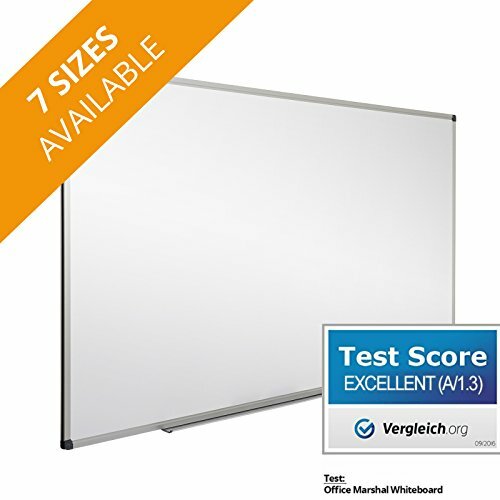 Unlike standard melamine dry erase boards, the Office Marshal dry erase board is protected by a unique impermeable coating, which prevents marker ink from penetrating into the inner layers of the surface, thus preventing staining. Anodizing is a method of increasing the natural thickness of the metal by enhancing the natural oxidization process, making it even harder and resistant to corrosion over time. Used to protect satellites from the harsh environment of outer space, you can be sure the anodized aluminum frame on your whiteboard will provide enough protection to last the test of time! The lightweight construction of the whiteboard makes it ideal for those on the go. Why not use the smaller size for team meetings, to allow for maximum contribution from everyone? IMPERMEABLE LACQUERED DRY ERASE BOARD SURFACE: Scratch resistant, impermeable surface, suitable for commercial use. Unique lacquer prevents marker ink from penetrating to the inner layers, preventing staining. ANODIZED ALUMINIUM WHITE BOARD FRAME: Anodizing is a method of increasing the natural thickness of the metal by enhancing the natural oxidization process, making it even harder and resistant to corrosion over time - Plastic corners for hidden screw fixing adds a professional lightweight finish to the sturdy frame. SHARP COLOUR CONTRAST: Suitable for all conventional dry erase whiteboard markers and pin board magnets, the highly pigmented gloss (anti-glare) surface provides excellent color contrast, for excellent readability. Ideal for use in the classroom, in the office or at home. MADE AND TESTED IN GERMANY: Made with German craftsmanship and tested according to stringent quality standards. Consumer tested and featured number one on Vergleich.org, independent product comparison site for consumers.